New homes sold in the Midwest region of the U.S. in June were at a seasonally-adjusted, annual rate of 71,000 homes, according to a report just released by the U.S. Department of Commerce and United States Census Bureau. June’s new home sales activity in the Midwest represents a 13.4% decline from May when new homes in the Midwest sold at an annual rate of 82,000 homes but is a 7.6% increase from June 2017 when the annual rate was 66,000 homes. Last year the rate of new home sales in this region increased every month after June up until December when it crashed but closed out the year with 72,000 new homes sold. In terms of the actual number of new homes sold this year in the Midwest region, there have been 44,000 new homes sold this year thus far, through the end of June. 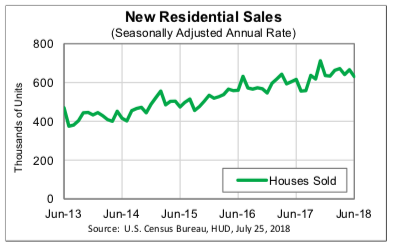 Last year, for the same time period, there were just 38,000 new homes sold in this region year to date so we are up 14.4% in non-seasonally adjusted, actual year to date new home sales in the Midwest through the end of June.